When my brother David decided to start his own business this past year as a music teacher and performer, I was excited to help him create an online presence for his business! Musician websites tend to be on the slightly outdated/difficult to navigate side of things, so our biggest priority was to make his website both welcoming and as easy to use as possible. 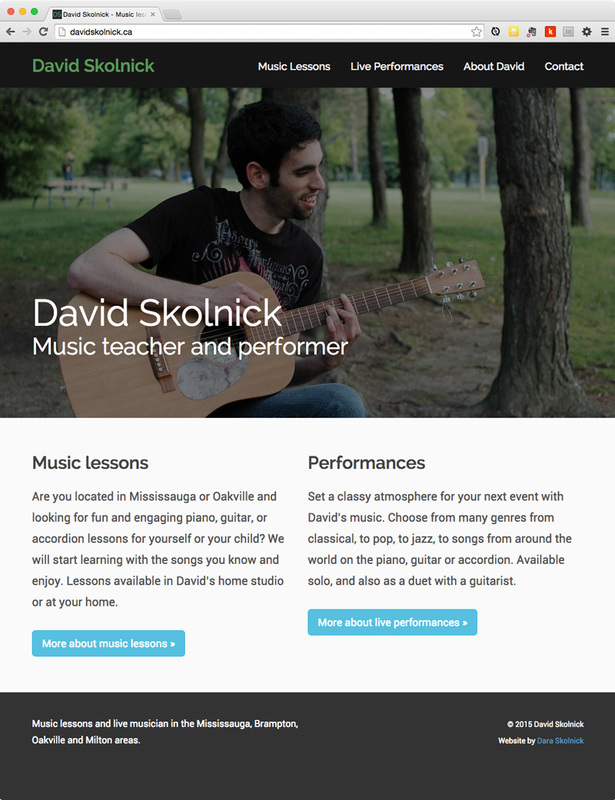 Prospective clients who want either music lessons or a live music performance can check out David’s music ahead of time, and when they’re ready to book, they can easily do so through the custom form on his Contact page. Within a few months of launching the site, David’s already been booked for live gigs and music lessons many times through his website and people often tell him that he has a great website that’s easy to use. Mission accomplished!